I have heard it said that managers don’t understand what we do. To some extent, that may be true, but to some extent, perhaps not. What on earth could I possibly mean? Simple. I am taking about the television show “Undercover Boss”. Personally, I have never actually watched the show. However, I love the basic premise. In short, a high level manager for a given company, somebody that very few at the lower level are familiar with, steps out of their office, dresses up in the attire of the other employees and works along side them. Yes, it is likely more complicated than that, but I am summarizing it as I understand it. Oddly, that show also serves as a great metaphor for what God did in becoming a man in the form of Christ Jesus. The God of the universe put aside, though retaining, his role as God, and took upon himself human flesh by being born of a woman. For roughly the next thirty years, God would walk along side and eat with his own creation. He would sleep, travel, and speak with them. Having been born, rather than just manifesting himself as he did to Abraham when announcing that Sarai would bear Abraham a son, he grew up like any normal human, yet was still fully God. As God, Jesus had all the authority of the father, yet he chose to restrain his power, even when he stood trial before Pilate, Herod, and the Sanhedrin. He could have called upon legions of angels to rescue him from execution upon the cross, yet he chose to suffer, as a man. Just like a high level manager stepping into the role of lower level employee, God took upon himself the role of a human, but for a greater purpose. He did this so that we may be saved from our sins and become sons of God. Oddly, in that through the sacrifice of Christ Jesus upon the cross for our sins, and his resurrection from the death, we are adopted into the family of God. In that, we are made sons of God and heirs to his glory. We then, by paradox, become both sinful humans and yet members of royalty. Yes, we who are in Christ Jesus are converted into children of the King awaiting the day when we shall enter into our father’s kingdom. This is only because of what Jesus did at the cross. Think of it this way, though we are often seated upon a forklift, we are children of the King, thus we are secret royalty. Secret for though we may live in this world, it is not our home. Secret for though we may be known by name by our coworkers, we have a name that is written in God’s book that says who we are to him. Our father is a king, and not just any king. He is the King of Kings. Just like a high level manager taking upon himself the role of an employee, our God and father has taken upon himself our humanity. Unlike that manager who comes away with a greater understanding of his employees and what they experience, our God comes to make us his children and to take us to his kingdom. If we believe this is true, and scripture affirms it, then we should live like children of the King of Kings. We do this when we abide by his commandments and decrees. We do this when we share his message of love with somebody that needs it. 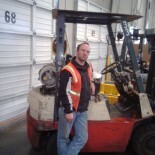 We do it when we help somebody with a difficult piece of freight or a stuck forklift. In all these things, when we come to assist others, we live as children of the king, who took our humanity upon himself to help us. Our father is the King, but only if we believe in Christ Jesus as our Lord and Savior and repent of our sins. Yes, the television show “Undercover Boss” can be used as a metaphor for what God as done, and yet, could it be that the opposite is true? God did it first, thus, perhaps “Undercover Boss” got its idea from the King, who in the form of Christ Jesus, was truly “Undercover Royalty”? got the courage to go ahead and give you a shout out from Huffman Texas! This entry was posted on 05/01/2014 by Christopher Rose in Uncategorized and tagged Adoption, Jesus, Royalty, Sanhedrin, Undercover Boss.